Since 2012, Jeep Beach has donated over $1.2 million to local charities through the event’s week long fund-raising efforts with all volunteers. All proceeds raised are distributed to charities throughout central Florida counties. Now you can help give back. Jeep Beach is a huge event and we can use volunteers to help put on the special event. Whether you want to get dirty at the off-site trail ride, or pull stranded Jeeps off the obstacle course, or maybe a “desk job” at registration, we can use help from you, your family, your Jeep club or other organization. Volunteers working more than 8 hours will receive a Volunteer t-shirt, Volunteers working more than 12 will receive two. Also if you work more than 12 hours with 8 or more at Cracker Ranch on Wednesday/Thursday or at the Speedway on Friday/Saturday you can earn a waived registration fee to the event. 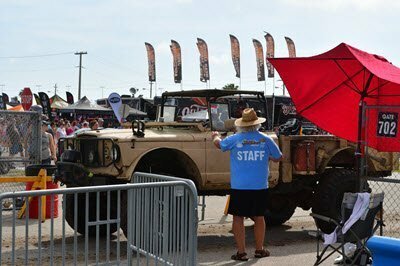 Although Jeep Beach is our largest event, Jeep Beach volunteers also help out locally throughout the year with food drives, disaster assistance, and participant in other charities’ events, as well as marketing of the Jeep Beach event all year long. Can’t volunteer for Jeep Beach 2019? Please check back after the event to sign up to receive updates about other volunteer opportunities with Jeep Beach Inc.